perfect for a snack any time of the day! We are a cheese loving family. My oldest son and I both love just about every cheese there is out there. Sharp cheddar, salty Parm, nutty Fontina...I don't think I've met a cheese I haven't liked! Because we love cheese so much, I tend to cook with it a lot. Grilled cheese sandwiches are a favorite. I love to try different kinds and flavor combinations and get all fancy rather than just going the traditional route. It's so much fun to be creative! 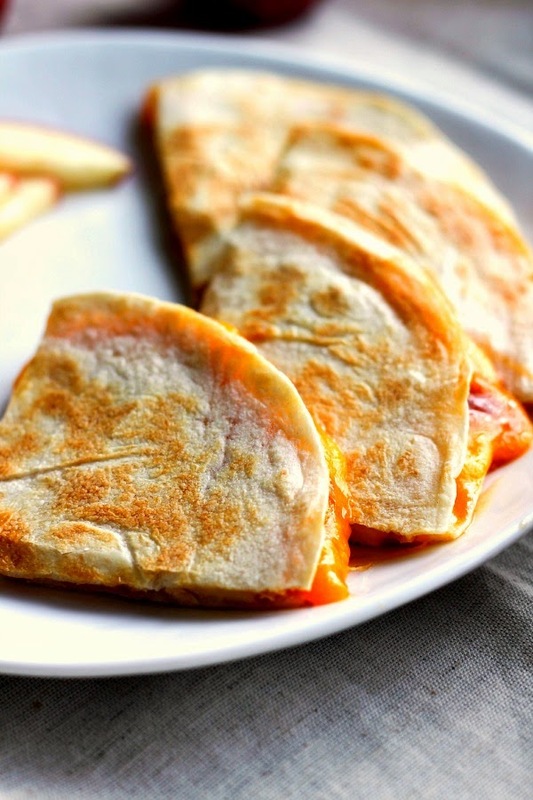 Along with grilled cheese, we also love quesadillas. I've been making my boys bean and cheese quesadillas for as long as I can remember, and they not only eat them for lunch sometimes, but also as a quick snack. I decided to switch things up a bit and make a fun, healthy quesadilla, a little bit more of a sweet treat. 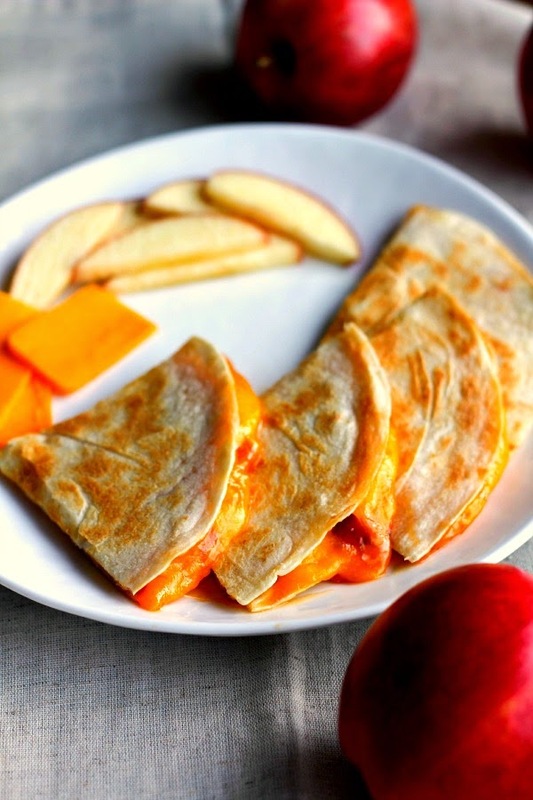 And that's when this delicious cheddar apple quesadilla was born. Crunchy honeycrisp apples, mild cheddar cheese, and sweet apricot preserves come together to make one heck of an afternoon snack. A little sweet, a little salty, a little crunch, all in one bite. It was a major hit with my family and I hope you will love them just as much as we do! Preheat a small skillet on the stove over medium-low heat. Lay the four tortillas out on a work surface. Divide the sliced cheddar cheese in half and lay the slices evenly on two of the tortillas. 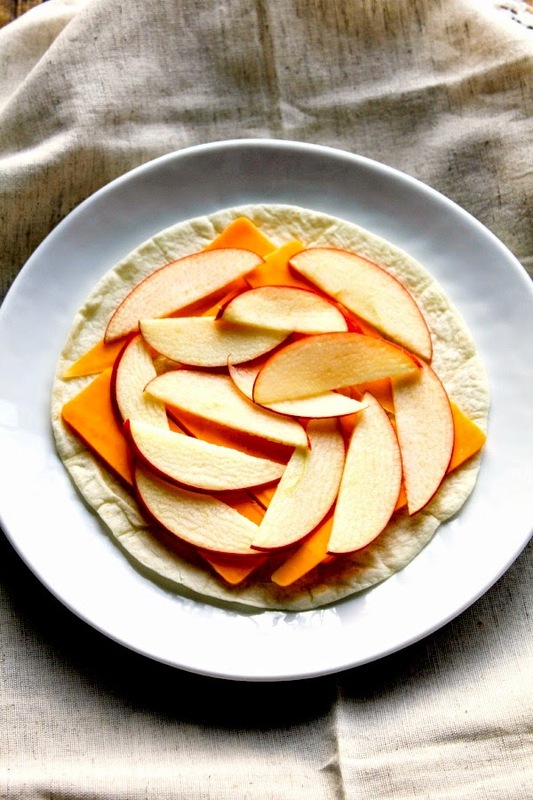 Divide the apple slices in half and place them on top of the cheese. On the other two tortillas, spread a tablespoon of the preserves on each. Please these tortillas on top of the tortillas with the cheddar and apples, preserve side down. Cook the quesadillas one at a time in the prepared skillet, placing them in the pan with the cheese side down. Cook for about five minutes, until nicely browned and the cheese has melted, then flip over. Cook for an additional five minutes, until the other side has browned. Remove to a cutting board and allow to cool for just a few minutes before cutting into four triangles and serving.